It feels like everyone is trying to copy Gucci lately. From chunky heeled loafers in suede and metallics to clothing that looks like it could be straight off of their runway, so many retailers are taking their cues from Gucci this fall. Case in point, I walked into H&M last month and it looked like the fall runway of Gucci had exploded all over their shelves! From embroidered tigers and bees to vivid florals like the one I am wearing today, it was hard to ignore the influence, not that I'm complaining. 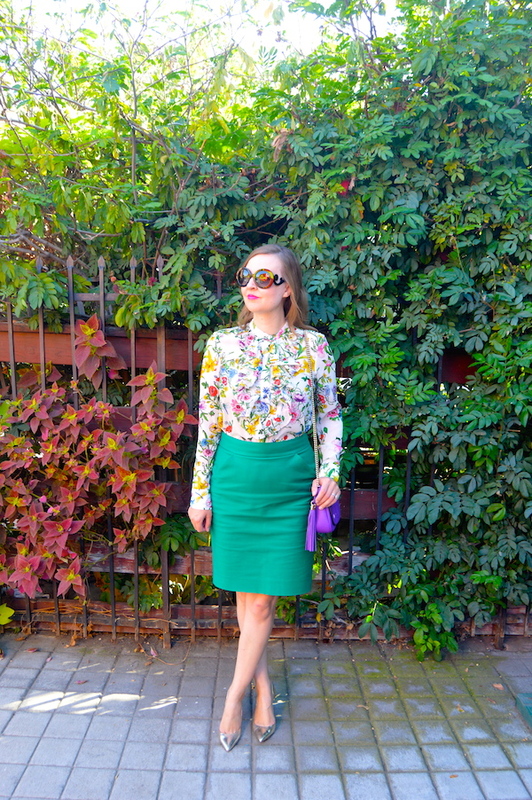 The print of this Plumeti blouse from H&M which I am wearing is clearly inspired by Gucci. I am not sure what it would retail for at Gucci, maybe $1000-$2000, but at H&M the the top was a mere $15! You just can't beat that! In my opinion, I'd rather save that money for fine leather goods like this bag that actually is Gucci. Although they no longer make this bag, I absolutely love this particular color and style. The purple color is gorgeous and I really like the tassel. And the hardware is ingeniously made to be not quite silver and not quite gold, so that it can be worn with either metal. I definitely don't mind paying extra for these lovely details and for the fact that it's made in Italy. Speaking of details, and getting back to the blouse, I love the fact that there are tiny dragonflies mixed in with the colorful floral design. I tried to feature this aspect of the print in the image below. This fun attention to detail also just goes to show that you don't have to spend a lot to get a lot! So what's my overall take away from this ensemble? I guess that it's fun to mix low and high end pieces together with one another. If you do it just right, you can look like you're dressed in designer labels from head to toe, but no one has to know what you splurged on and what you saved on! Well retailers are learning from the best. I mean come on - Gucci. 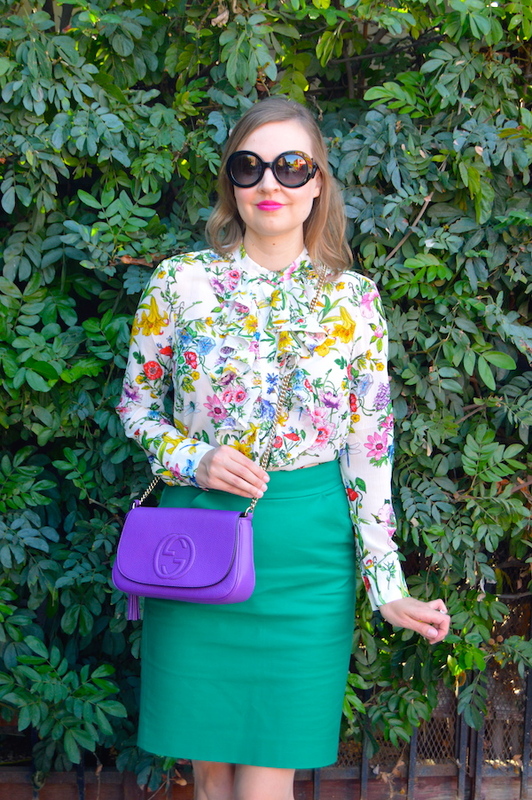 That floral blouse is beautiful and I love the colors of this outfit but man that purple leather Gucci bag is stunning! I saw this at H&M but my size was all gone....You look gorgeous in it and the color is just perfect! I adore your outfit! So chic. The floral is just amazing. The print is exquisite! 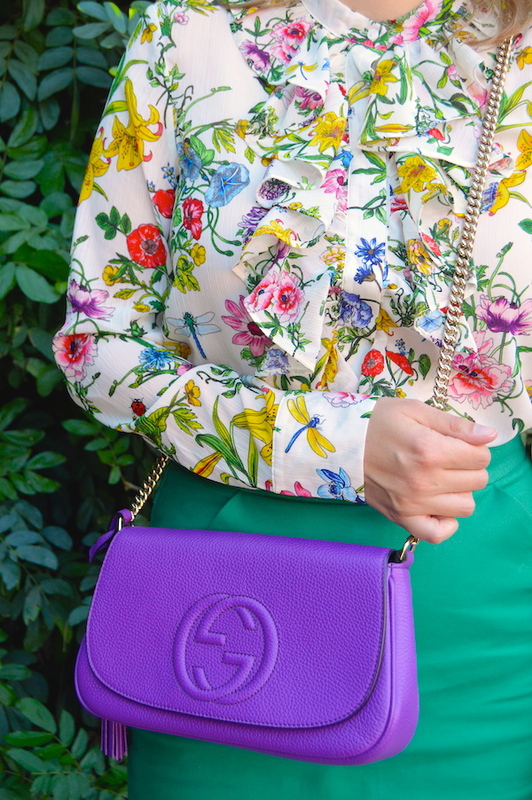 I love the combination of green and purple, your Gucci bag is gorgeous!